i had asked for these blue tights of Leg Love by Kate Torralba from my manito (Secret Santa) for Christmas…and luckily, he found it. and now, when i think about it, it is such a bold shade of blue. an eye-catcher you might say. i wore this once with dotted tights over them (here!) and they looked subtle then — and that was for a vudu party. so…i gathered all my courage and decided to wear them for work as i also needed a boost of confidence from the effects of work blunders last Tuesday. people stared. people were shocked and nearly dropped their jaws…i even had one agent ask me why i’m wearing such blue tights. and it kept me smirking the whole time because some people looked so funny trying not to stare in the elevator (in such a small space! )… nevertheless, i loved wearing these tights. despite everything, i stood out and i was myself again. who cares if they can’t understand. i want to talk some more but my puppy is on my lap and has his head on my right arm. he gets mad when i type too loudly..haha! I say wear them again. They're gonna have to get used to it. They're too cute not to. I love all the colors, so cute! I adore your blue thights and your printed top!! Oh hi! Thank you for dropping by my site and leaving nice comments! 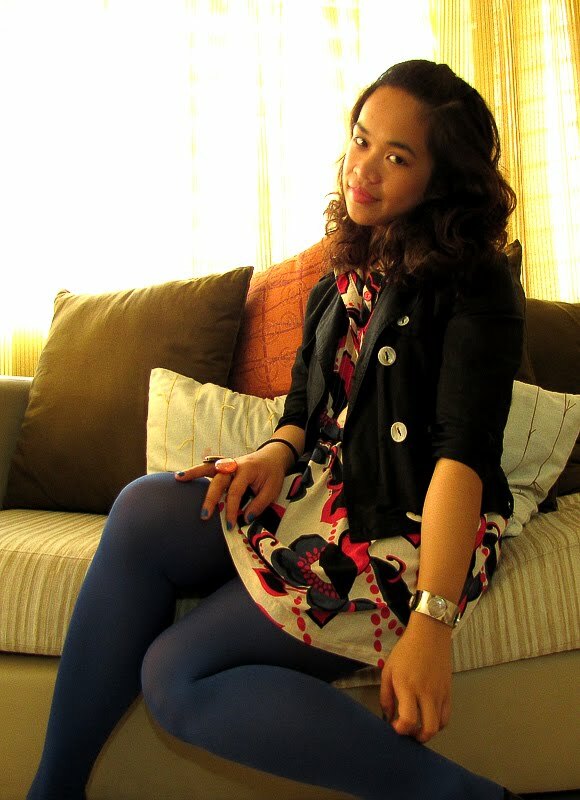 Adorable blue tights! 🙂 And the blazer too! Ah, love the color! Do you work at a call center? I used to work at one in Cebu, but didnt last for long, my ADD wouldnt allow it, haha. 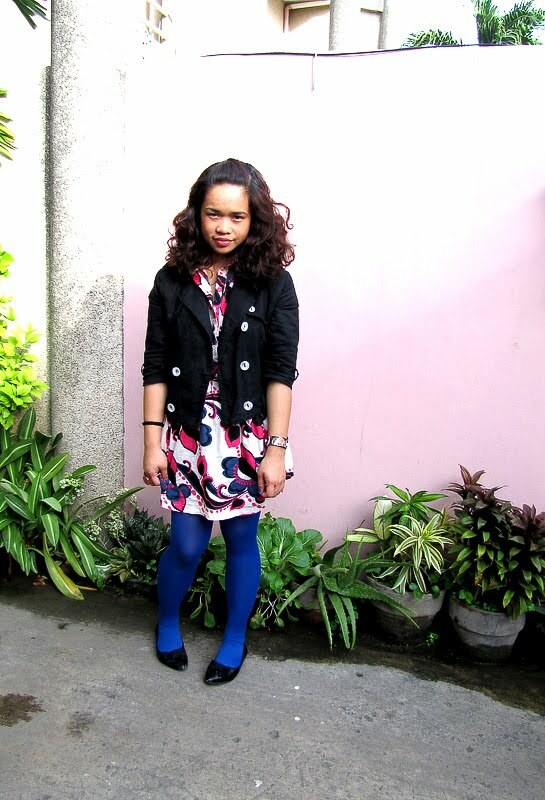 The tights are perfect considering its been really breezy in Cebu.. I was freezing today waiting for a cab. 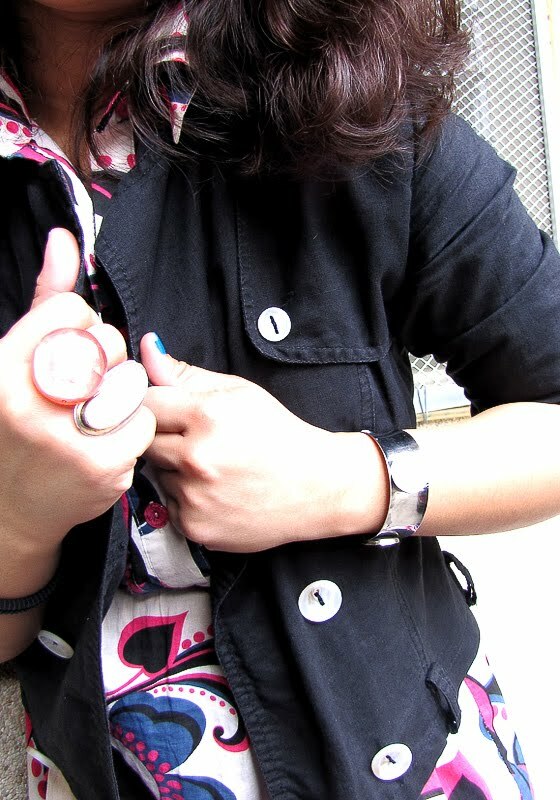 I really really love you style, your blog inspiring me so much!! great colors! very nice outfit! love this color of blue! Thanks for stopping by my blog! This outfit is absolutely fabulous!! I love the whole color combination: blue, black, and a patterned dress. You look gorgeous! amazing mix and matching. you look great! Don't mind them Gizelle… the tights looked great on you. love your tights and the mixing of the patterns. nice blog. you have such a unique sense of style. Love the blue tights & printed top.. they're adorable together! i love your outfit! just keep dressing the way you like and soon enough, your coworkers will stop acting so shocked. wear them again, G! who cares if they make a snide remark about it. as long as you feel good wearing them, then by all means, flaunt 'em! hahah i second the big men comment. i love how almost this entire outfit is thrifted. thrift stores are such a goldmine ! that's the blue i like. have a great weekend pretty lady. I'm weak for tights, Gizelle! They're just so fun! Suits you! You get the sun when I get the snow that is sooo unfair. Anyway, love the tights ! Aw your puppy is adorable =) And ha I love those tights, screw what others say! beautiful tights, you stand out in the best way possible! I'm such a bookworm too! And I have read Wicked, but I haven't read the other two books. I read it in eighth grade, so some of certain areas confused me, but perhaps I'll give it a try again now that I'm older and can probably understand better! i have a pair of blue tights just like that… i wear them all the time too! no worries – you look fabulous. love the pattern of your dress as well.